If there’s one thing fans are most looking forward to in Captain America: Civil War, it has to be the fight scenes. After watching everyone team up in the various films, we want to see them throw down! And the one fight everyone will be keeping their eyes peeled out for is Spider-Man’s fight. Seeing as this is the wall-crawler’s Marvel Cinematic Universe debut his fight will be extra special. It was already rumored that Spidery will join up with team Iron Man, meaning he could possibly trade blows with anyone on team Captain America. It could be Hawkeye, Ant-Man or even Falcon. But the word out there is that Peter Parker has his sights set in some pretty big game. Heroic Hollywood has the news that Spider-Man will actually throw hands with none other than the Star-Spangled Avenger himself, Captain America! That’s a big first fight in the MCU, if this pans out to be true. Cap has fought gods, aliens and even homicidal robots. How tough could a teenager from Queens really be? Hopefully tough enough to make a compelling battle. Captain America does have a bit of a funny bone, too. Could he trade verbal shots with Spidey as well as physical ones? 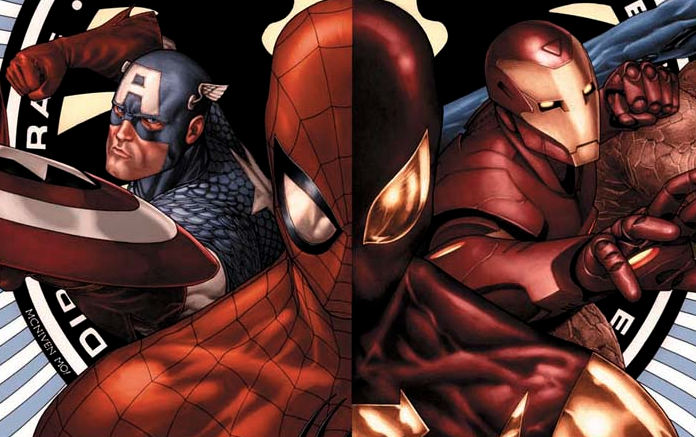 We’ll find out when Captain America: Civil War hits theaters May 6, 2016, less than eight months away!